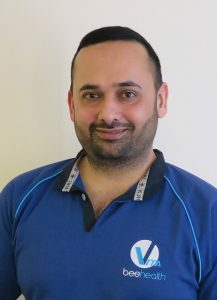 Amarinder Singh has been appointed regulatory and quality manager at Vita Bee Health. He will help guide Vita’s products through the regulatory process to ensure that professional and hobbyist beekeepers will have the highest quality, safe and effective treatments for their honeybees. After graduating with a Masters degree in biotechnology from the University of Hertfordshire (2007), Amarinder worked for The Medicines and Healthcare products Regulatory Agency (MHRA), then the Veterinary Medicines Directorate (VMD) as a pharmaceutical assessor in the quality team, work which included establishing guidelines for applicants and assessors, and most recently for Benchmark Animal Health. He has experience in working internationally and with a wide range of health products for animals. Vita Bee Health is a trading name of Vita (Europe) Ltd, which was established in 1997 and has become the largest dedicated supplier of products to the honey and pollination industries through its global network of distributors covering more than 50 countries. Vita’s honeybee health product range includes anti-varroa acaricides – Apistan® (outside the USA/Canada) and Apiguard® – wax moth controls, foulbrood diagnostic kits and health-promoting feeds. Vita also supplies Asian hornet traps, Small Hive Beetle traps, the Bee Gym varroa grooming aid and swarm lures. Vita products have been registered by more than 60 veterinary authorities.